I have the Noyz Performance Kit that comes with a case and 3 different lenses. The frames are matte black and I have the laser black lenses, photochromic clear to black and photochromic clear to red lenses. I don’t wear the clear to black lenses that often. I generally wear the laser black lenses when it is real sunny and the red lenses when there is an overcast or mostly dark riding in the woods. I think the red lenses help with contrast in low light. 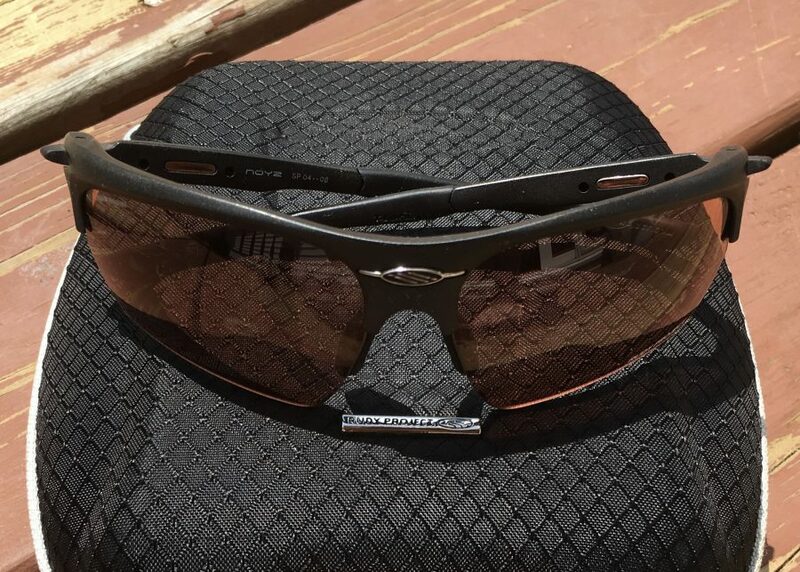 That being said, I will wear the clear to black photochromic lenses if I will be going in and out of heavily wooded trail to open sunlight trail and they seem to keep up and change quick enough. I do not like the clear photochromic in extreme light though. These glasses are designed for athletic use, but I have been using them a lot lately for everyday use with the mirrored laser black lenses. I have had a lot of issues scratching glasses in the past, but these survived a couple years of heavy mountain biking use with very minimal scratching on the lenses. I’ve even dropped the lenses on concrete without scratching. They are also really comfortable and I have worn them for multiple 100 mile mountain bike races. I had mentioned previously in this review that I had the lenses pop loose a couple times. A reader pointed out that I had the lenses flip flopped in the previous picture… He was righ and sure enough, I went back to some race pictures from when I remember this happening and I had the lenses flip flopped at that time as well. That was really my only gripe with the glasses and that was all my fault. I don’t know why I didn’t catch that myself, but the lenses are locked in very good when installed in the correct position. I’ve now updated my rating to 5 star. They really are a great set of glasses. Interchangeable Lenses – Lots of lens options, but I chose the kit that came with 3 different lenses that seem to cover all my needs. Adjustable Nose Piece – I am a big fan of the nose piece on these glasses. They adjust really easy, but still hold there form well. They never slip off either. My previous pare of glasses were a lesser expensive set of Tifosi’s and they always slipped down my nose. Adjustable Temples – These glasses are a bit narrow, even for my medium helmet size head and I had to widen the adjustable temple pieces out to make them fit nice. To be fair, I am at the top end of the medium helmet size and could easily fit in a large helmet as well. Lenses – Rudy Project sells a variety of lens for all of their glasses. Case – I ordered the kit that came with the case, but I believe you can purchase it separate if you did not order the kit. It’s a really nice case that holds 4 sets of lenses, the frame with lenses in it and a spot for a cleaning cloth. As far as functionality and getting the job done… these glasses rock and the lenses themselves are rock solid. They are also really comfortable and light weight. The case that came with my set is really nice as well.